Abstract. 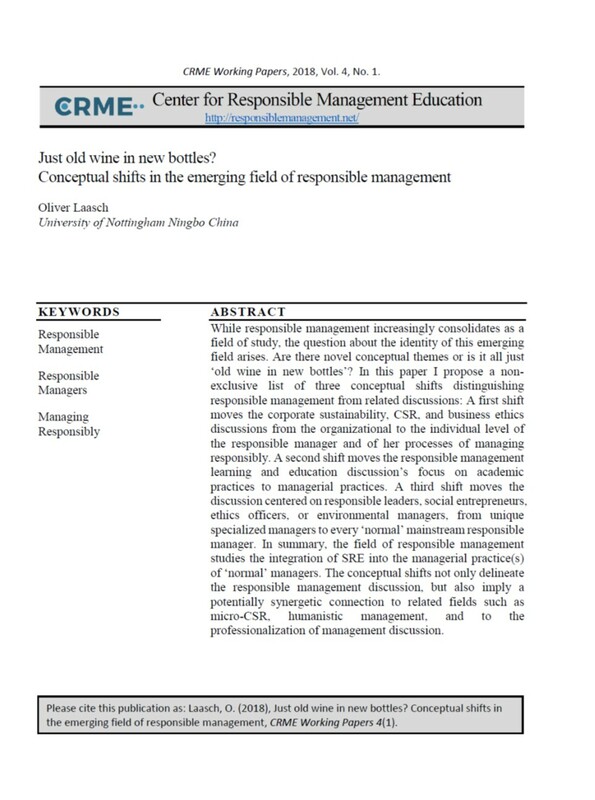 While responsible management increasingly consolidates as a field of study, the question about the identity of this emerging field arises. Are there novel conceptual themes or is it all just ‘old wine in new bottles’? 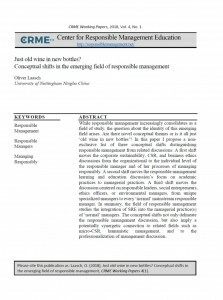 In this paper I propose a non-exclusive list of three conceptual shifts distinguishing responsible management from related discussions: A first shift moves the corporate sustainability, CSR, and business ethics discussions from the organizational to the individual level of the responsible manager and of her processes of managing responsibly. A second shift moves the responsible management learning and education discussion’s focus on academic practices to managerial practices. A third shift moves the discussion centered on responsible leaders, social entrepreneurs, ethics officers, or environmental managers, from unique specialized managers to every ‘normal’ mainstream responsible manager. In summary, the field of responsible management studies the integration of sustainability, responsibility, and ethics (SRE) into the managerial practice(s) of ‘normal’ managers. The conceptual shifts not only delineate the responsible management discussion, but also imply a potentially synergetic connection to related fields such as micro-CSR, humanistic management, and to the professionalization of management discussion. ‹ HOW TO harness digital badges for RML?